While she was publishing “Reizoko ni Pineapple Pie” which I mentioned in this blog before, Iwadate Mariko started another serial titled “Uchi no Mama ga Iukotoniwa”. This work which was published in a magazine “Young You” described an engaged young couple, Kitakaze Keito and Amanatsu Eitaro, who were wavering with their marriage in sight. 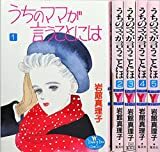 The fantastic atmosphere which was seen when she serialized her works in Weekly Margaret somehow vanished, and what is depicted here is young people’s hesitation or puzzlement they feel in the face of the real problem. This work is the longest one among her works, and actually, it ends up unfinished. I keep hoping that I can read the rest of the story some day.